When first looking into writing SQL Server Reporting Services (SSRS) Reports in Visual Studio, it’s easy to think that creating a report will be possible straight out of the box with one of the existing templates that Visual Studio comes with. Somewhat surprisingly, this is not the case for Visual Studio 2012 and 2013. After running the download component from the Microsoft site, the real download is fairly large and could take a good 10 to 20 minutes depending on your internet connection. The install process also takes a while, so you should probably plan to grab a coffee while the process completes. Expand this project template and select the Reporting Services option. You can now either choose to use the setup wizard or just a plain project template. 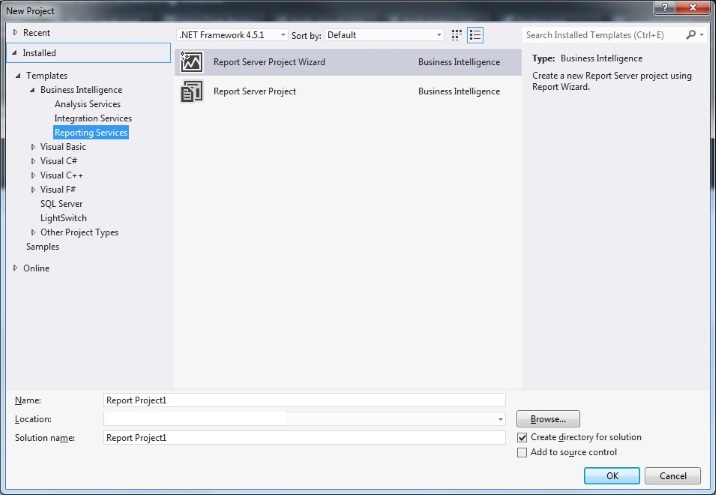 See the example image at the start of this article for a screen shot of what it looks like to select the new Reporting Services project template in Visual Studio 2012. So there you go, that’s what is needed to be able to create or work with SSRS reports in Visual Studio. Note that once you have built your SSRS report, you will need to publish it to your Reporting Services server in order for it to be available to your user-base.